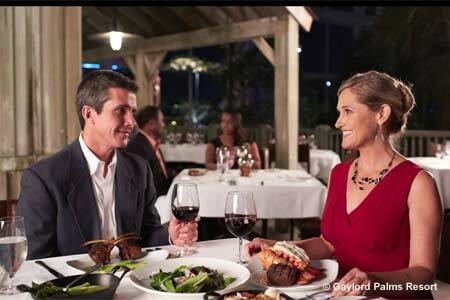 The Gaylord Palms Resort's steakhouse boasts an exotic yet upscale "help-I'm-stuck-in-a-swamp" Everglades-inspired décor. : Along a path through the mysterious "Everglades Atrium" at the Gaylord Palms Resort (watch for gators, but just little ones), you'll find a sophisticated outpost of American steakhouse wizardry, from the signature 100 percent grass-fed beef tenderloin to a cowboy rib-eye. Top the steak with black truffle demi-glace or a lobster tail. Start off with hand-chopped beef tartare, slow-braised pork belly or the signature Old Hickory crab cake with green tomato jam. Most of the short list of entrées is appealing and straightforward, and includes a wild-caught salmon, bone-in braised short ribs and Lake Meadow chicken. A maître d'fromage is on hand to help you choose from the list of artisanal cheeses served with spiced roasted almonds, local Winter Park honeycomb and dried dates. Several certified sommeliers on staff will graciously explicate the world-beat wine list, focused exuberantly on big reds. Steaks and chops are married with traditional accompaniments and sauces (mac ‘n’ cheese with lobster, creamed spinach), but don't fill up so you can indulge in dessert. When the chocolate-dipped pecan derby pie or the Myers’s rum crème caramel arrives at the table, you’ll be glad you did.